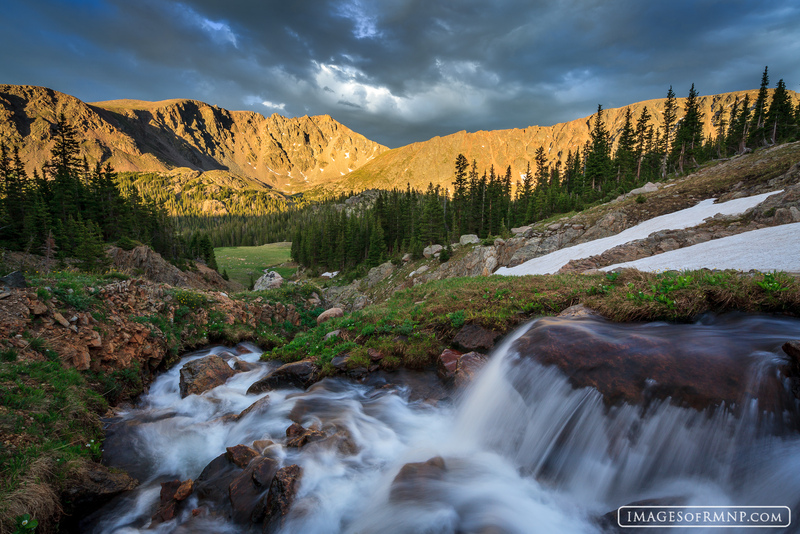 These images are my favorite Rocky Mountain National Park photos from 2012. They may not be the most popular or the best selling but they are the ones that I would put at the top of my list for the year. Often, the reason for their selection has a lot to do with my experience at the time and the emotions I felt while viewing these scenes. 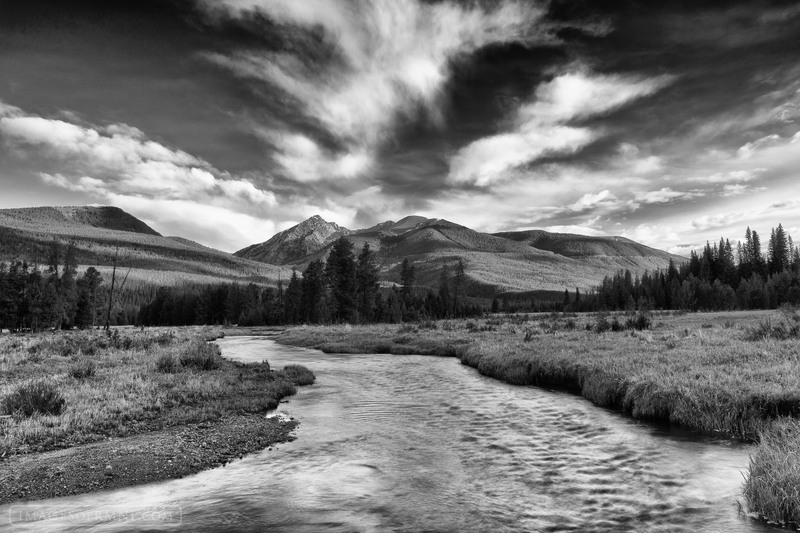 I guess what surprises me is that after 9 years of photographing Rocky Mountain National Park, I continue to find new views and possibilities that have never been shot before. To me that is exciting and gives me hope for the future. This morning I awoke to a dark and cloudy day. I almost decided to spend a quiet morning at home when I noticed just how low the clouds were. Realizing the possibility, I jumped into my car and raced up Trail Ridge Road to Rainbow Curve. I arrived just a few seconds before the sun came over the horizon. What a surprisingly beautiful start to the day. Photo © copyright by Erik Stensland. It was the first morning of October. The air held a hint of crispness, mixed with the fragrance of fall leaves. 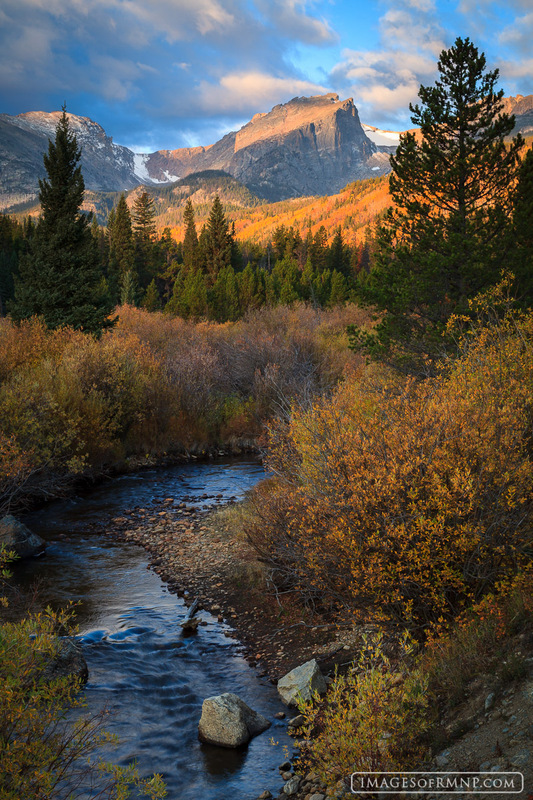 The willow were dressed in their fine autumn coat, the waters of Glacier Creek gently meandering between them. High above, Hallett Peak stood tall while a dusting of snow covered nearby Otis Peak. Could anything be more perfect? Photo © copyright by Erik Stensland. Those who climb to the highest points of Rocky Mountain National Park enjoy a world seen by few others. Here the air is thin and the views are long. This is harsh, unforgiving terrain but the beauty to be found makes the risk worthwhile. 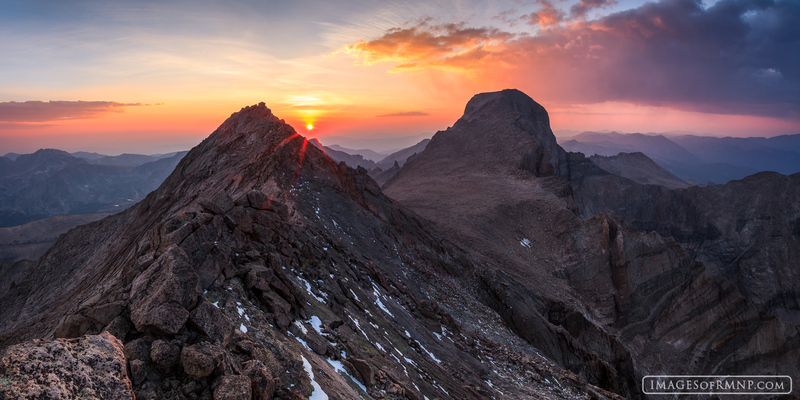 In this image Mount Meeker and Longs Peak reach skyward as the sun sets in the west. Photo © copyright by Erik Stensland. This is my favorite perspective of the Kawuneeche Valley. It seems to me like one of those classic western scenes which almost begs to be photographed. From this viewpoint you can see the mighty Colorado River begin its journey southward as Mount Baker and Mount Stratus watch from above. Photo © copyright by Erik Stensland. This is my idea of an idyllic mountain scene with mountains, meadow, cascades and sweet light. These are the moments I search for when out photographing, but only rarely find. On this evening I was in a remote location and had this entire valley to myself as the last light of the day warmed the mountains while the recently melted snow danced down the rocks in front of me. Photo © copyright by Erik Stensland. On this cold January morning, the sky put on one of the most amazing shows I've ever seen. 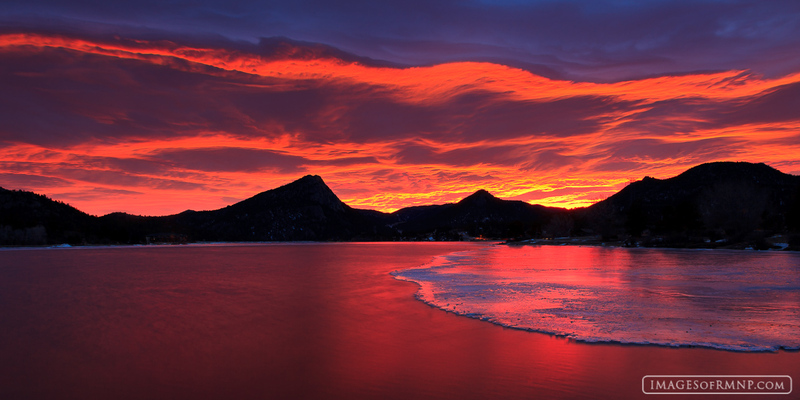 While children were riding the bus to school and people were driving to work, the rising sun found a crack in the thick clouds and created an incredible array of intense colors which reflected off the partially frozen Lake Estes. Cars were pulling over and people were standing alongside the road taking photos with their cell phones. It was truly an epic morning in Estes Park. Photo © copyright by Erik Stensland. The great cathedrals of Europe were built to create a sense of awe and wonder. 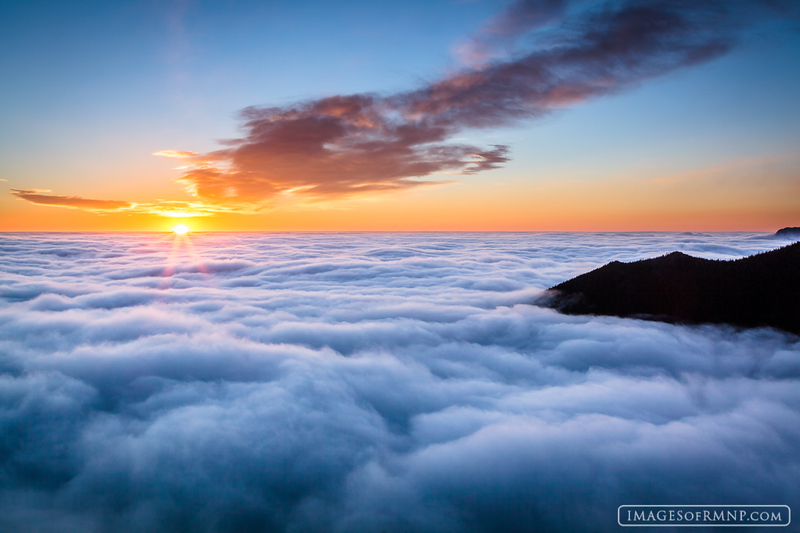 They force us to lift our eyes and realize just how small we actually are while giving us a glimpse of the greatness of God. 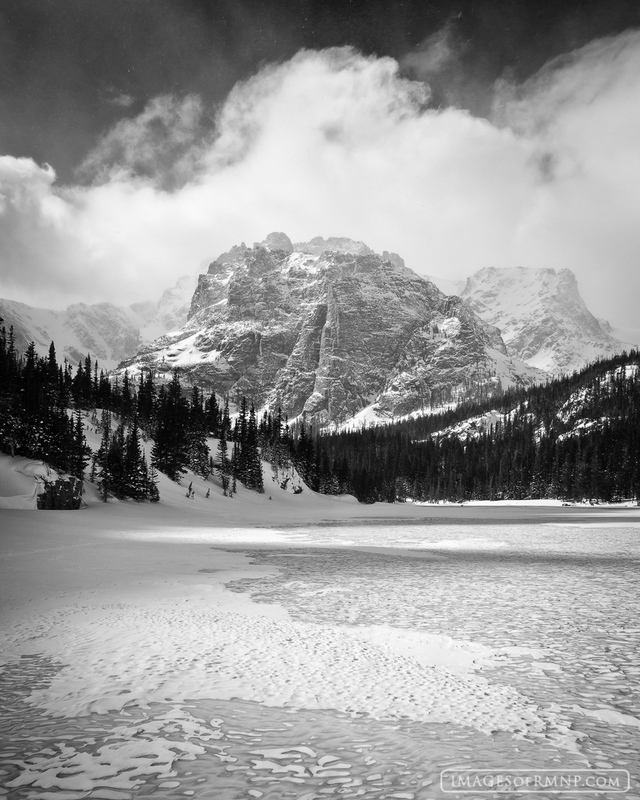 Rocky Mountain National Park here in Colorado has a rock formation known as "The Cathedral" just above The Loch. It is aptly named for it, too, as it causes us to stand in wonder and recognize a greatness far beyond ourselves. Photo © copyright by Erik Stensland. 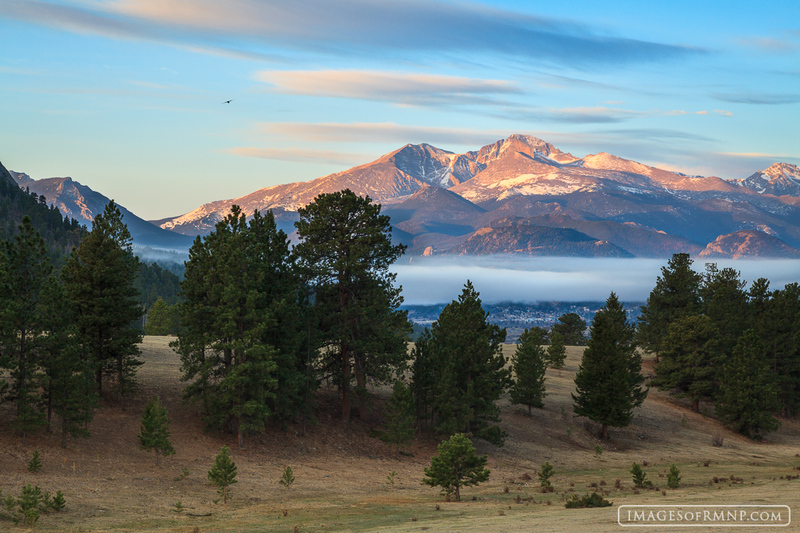 On this April morning fog settled over the Estes Valley while gentle clouds drifted above. This type of weather rarely happens up here in our dry air. I had intended to head for the mountains for sunrise but I couldn't resist the potential provided by the fog. It took me quite a while to find a good spot to incorporate both the fog and Longs Peak with its fresh snow, but in the end I found a spot near Eagle Rock. The bird in this photo was a wonderful surprise. 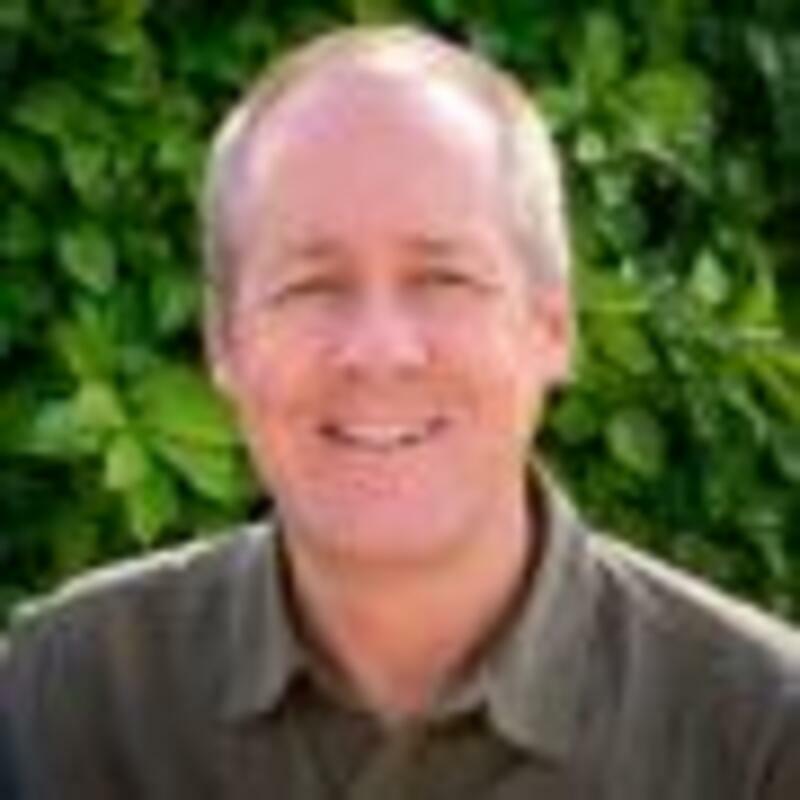 I had no idea he was in the photo until I saw the image later. Photo © copyright by Erik Stensland. 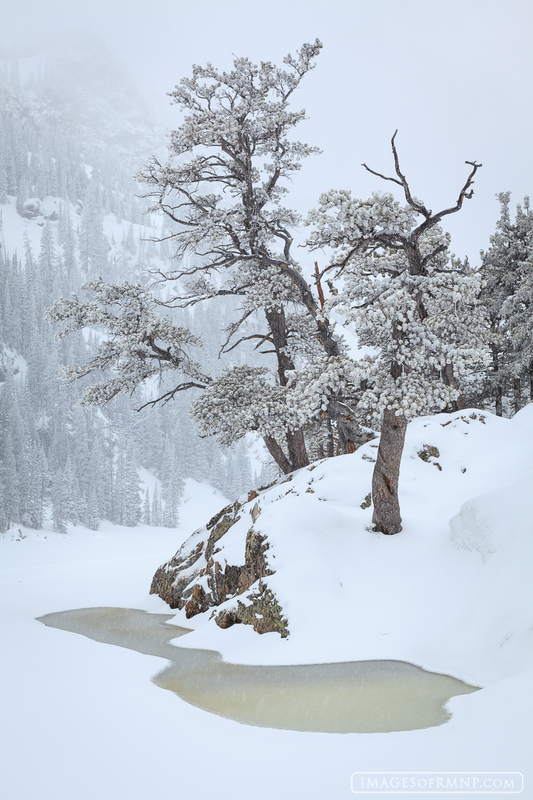 Dream Lake begins to thaw in early April following a spring snowstorm. I've always found these trees to have a very artistic quality to them and today with their fresh coating of snow and ice they looked particularly attractive. Photo © copyright by Erik Stensland. One of the things I like to look for in nature is repeating patterns. They can be found all around us, and for some reason they bring us a great deal of pleasure to look at. Perhaps it is that feeling of stability or interconnectedness of everything that resonates with us when we see these repeating patterns. 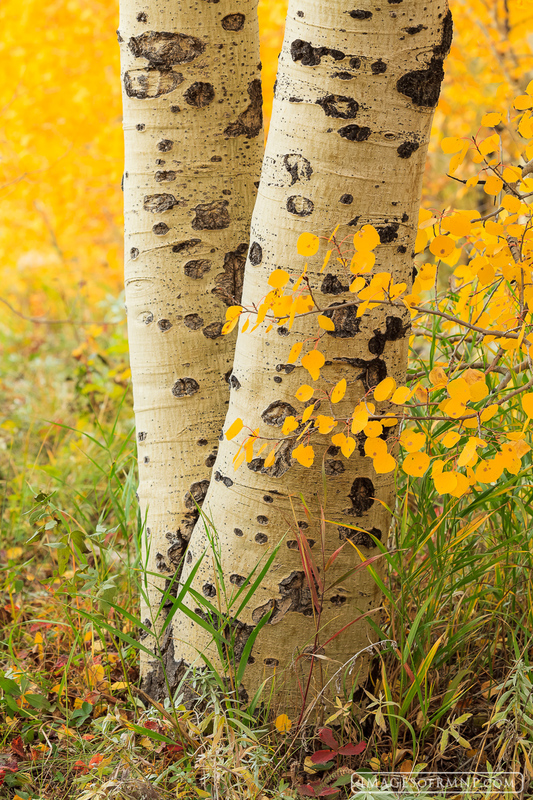 In this image, the aspen tree almost seems to mimic the leaves around it as it shows off its spots. Photo © copyright by Erik Stensland. 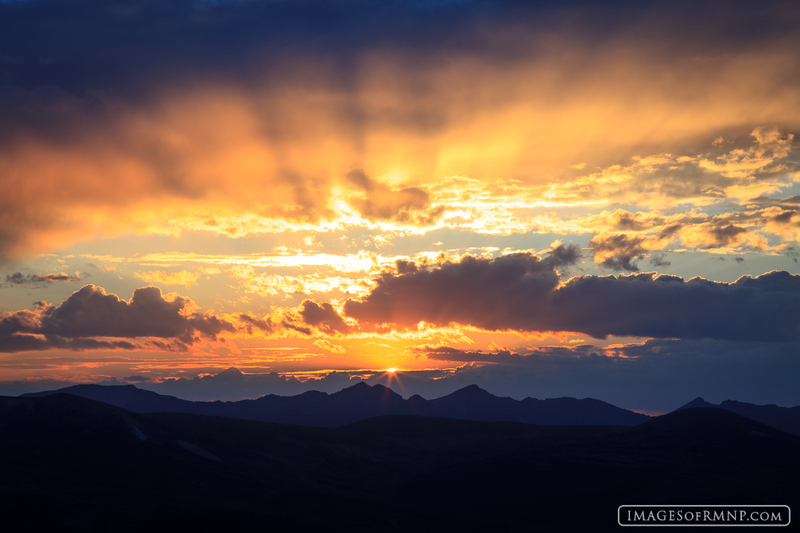 On this cloudy evening I was up on Trail Ridge Road hoping for a beautiful sunset. During the final minutes the sky put on a dramatic show behind the Never Summer Mountains while a bull elk stood only a couple of hundred feet behind me with his harem, bugling every so often. It is in these magical moments when I find myself gently humming Louis Armstrong's song, "What a Wonderful World". Photo © copyright by Erik Stensland.